Kim Seong-kon, president of the Literature Translation Institute of Korea and Seoul National University professor emeritus, was honored by the State University of New York last month for his lifelong contributions to strengthening academic and cultural ties between the US and Korea. 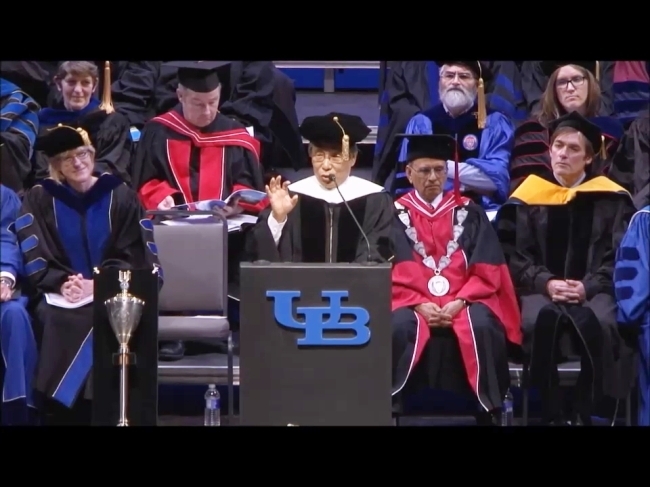 Kim was conferred with a SUNY Honorary Doctorate in Humane Letters during the commencement ceremony on May 19 at the University at Buffalo campus. He also gave a speech at the event for graduating students. Kim received his doctorate in English literature from SUNY at Buffalo in 1984, and has taught at Seoul National University. “The SUNY at Buffalo was the wellspring of literature studies in the early 1980s when I studied there,” Kim told The Korea Herald, adding that scholars like Michel Foucault, John Coetze, Charles Olson, Robert Creeley, John Barth and Leslie Fiedler had taught there. Kim also received the International Distinguished Alumni Award from the school in 2012 and served as president for the SUNY at Buffalo Alumni Association Korea Chapter from 2013 to 2015.